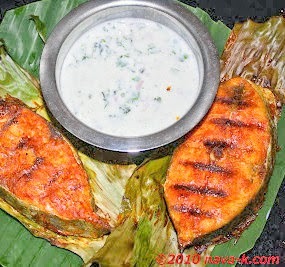 The Indian style to Grilled Fish In Banana Leaf and when we speak about Indian grilled fish, the basic reality has to be at least chilli powder and turmeric powder? Of course. Even without banana leaf, you can grill fish lathered with chilli powder and turmeric powder on tawa, or flat pan, or over the stove grilling (Otak-Otak Ikan). Precisely how I made this grilled fish and of course banana leaf wrap will elevate the taste further (Sambal Tumis Ikan Pari). Plus, I also made a raw yogurt dip. Yogurt, shallots and coriander leaf dip. Marinate fish at least for 2 hours with all the ingredients except the oil. Leave it in the fridge and bring out only before grilling. Wrap individually as two separate parcels with banana leaves. Place on heated grill and drizzle oil over. Let it cook/grill over low heat. In between, press with spatula over the wrapped fish. Cook on both sides till leaves are brown and crispy. Test, gently poke fish with a fork. If fork comes out clean, it's done. Remove from grill and serve with the yogurt sauce.